This vignette demonstrates the functionality provided by the corpus R package. The running example throughout is an analysis of the text of L. Frank Baum’s novel, The Wonderful Wizard of Oz. We load the corpus package, set the color palette, and set the random number generator seed. We will not use any external packages in this vignette. The The Wonderful Wizard of Oz is available as Project Gutenberg EBook #55. We first download the text and strip off the Project Gutenberg header and footer. # ...end ends at the Project Gutenberg footer. The novel starts with front matter: a title page, table of contents, introduction, and half title page. Then, a series of chapters follow. We group the lines by section. The corpus_frame() function behaves similarly to the data.frame function, but expects one of the columns to be named "text". Note that we do not need to specify stringsAsFactors = FALSE when creating a corpus data frame object. As an alternative to using the corpus_frame() function, we can construct a data frame using some other method (e.g., read.csv or read_ndjson) and use the as_corpus_frame() function. A corpus data frame object is just a data frame with a column named “text” of type "corpus_text". When using the corpus library, it is not strictly necessary to use corpus data frame objects as inputs; most functions will accept with character vectors, ordinary data frames, quanteda corpus objects, and tm Corpus objects.. Using a native corpus object gives better printing behavior and allows setting a text_filter attribute to override the default text preprocessing. "aunt"     "em"       "had"      "just"     "come"     "out"      "of"       "the"
 "house"    "to"       "water"    "the"      "cabbages" "when"     "she"      "looked"
 "up"       "and"      "saw"      "dorothy"  "running"  "toward"   "her"      "." "\""       "my"       "darling"  "child"    "!" "\""       "she"      "cried"
 ","        "folding"  "the"      "little"   "girl"     "in"       "her"      "arms"
 "and"      "covering" "her"      "face"     "with"     "kisses"   "." "\""
 "where"    "in"       "the"      "world"    "did"      "you"      "come"     "from"
 "?" "\""       "\""       "from"     "the"      "land"     "of"       "oz"
 ","        "\""       "said"     "dorothy"  "gravely"  "." "\""       "and"
 "here"     "is"       "toto"     ","        "too"      "." "and"      "oh"
 ","        "aunt"     "em"       "!" "i'm"      "so"       "glad"     "to"
 "be"       "at"       "home"     "again"    "!" "\""
 "up"       "and"      "saw"      "Dorothy"  "running"  "toward"   "her"      "My"
 "darling"  "child"    "she"      "cried"    "folding"  "the"      "little"   "girl"
 "in"       "her"      "arms"     "and"      "covering" "her"      "face"     "with"
 "kisses"   "Where"    "in"       "the"      "world"    "did"      "you"      "come"
 "from"     "From"     "the"      "Land"     "of"       "Oz"       "said"     "Dorothy"
 "gravely"  "And"      "here"     "is"       "Toto"     "too"      "And"      "oh"
 "Aunt"     "Em"       "I'm"      "so"       "glad"     "to"       "be"       "at"
In addition to mapping case and quotes (the defaults), I’m going to drop punctuation. "i"             "live"          "in"            "new_york_city" ","
This example using the optional second argument to text_tokens to override the first argument’s default text filter. Here, instances of “new york” and “new york city” get replaced by single tokens, with the longest match taking precedence. See the documentation for text_tokens describes the full tokenization process. The mental model of the corpus package is that a text is s sequence of tokens. Every object has a text_filter() property defining its tokens. The default token filter transforms the text to Unicode composed normal form (NFC), applies Unicode case folding, and maps curly quotes to straight quotes. Text objects, created with as_corpus_text or as_corpus can have custom text filters. You cannot set the text filter for a character vector. However, all corpus text functions accept a filter argument to override the input object’s text filter (this is demonstrated in the “New York City” example in the previous section). To find out the number of tokens in a set of texts, use the text_ntoken function. "two, three!" "5 6 7 "
Negative indices count from the end of the sequence, with -1 denoting the last token. Note that text_ntoken and text_sub ignore dropped tokens. "wind,\nDorothy soon closed her eyes and fell fast asleep." "just that way, and was not surprised in the least." "made you?\"\n\n\"No,\" answered the Scarecrow; \"it's a lighted match.\""
"up in another\ncorner and waited patiently until morning came." "nor straw, and could not live unless she was fed." "me a heart of course I needn't mind so much.\""
"would soon send her back to her own home again." "grass\nand waited for the fresh breeze to waken her." "a tree near by, which she\nate for her dinner." "through the portal into the streets of the Emerald City." "cackling of a hen that had laid a\ngreen egg." "that they were no longer prisoners in a strange\nland." "three cheers and many good wishes to\ncarry with them." "How\nlucky it was you brought away that wonderful Cap!\""
"if he did she was willing to forgive him everything." "I'm sure I don't know\nhow it can be done.\""
"loss of the Wonderful\nWizard, and would not be comforted." "all get ready, for it will be a long journey.\""
"Tin Woodman, \"for we certainly must\nclimb over the wall.\""
"are worse things in the\nworld than being a Scarecrow.\""
In this example, we do not specify the ending position, so it defaults to -1. The text_ntoken, text_ntype, and text_nsentence functions return the numbers of non-dropped tokens, unique types, and sentences, respectively, in a set of texts. We can use these functions to get an overview of the section lengths and lexical diversities. We can see that the last chapter is the shortest, with 74 tokens, 56 unique types, and 8 sentences. Chapter 12 is the longest. Heaps’ law says that the logarithm of the number of unique types is a linear function of the number of tokens. We can test this law formally with a regression analysis. In this analysis, we will exclude the last chapter (Chapter 24), because it is much shorter than the others and has a disproportionate influence on the fit. 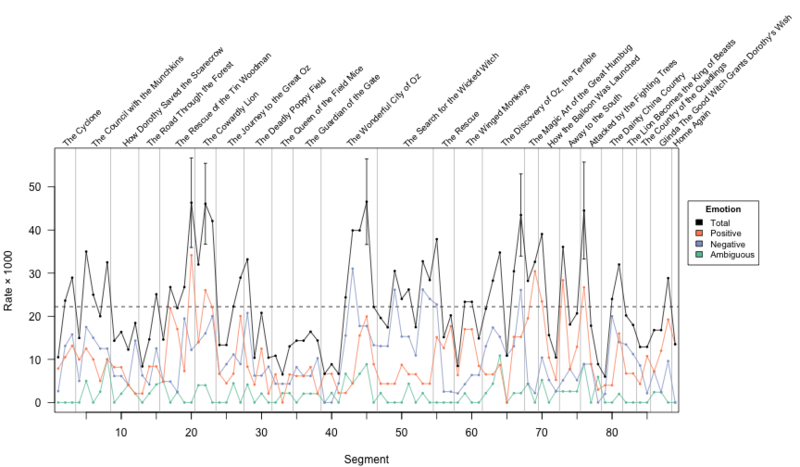 subset <- row.names(stats) != "ch24"
The analysis tells us that Heap’s law accurately characterizes the lexical diversity (type-to-token ratio) for the main chapters in The Wizard of Oz. The number of unique types grows roughly as the number of tokens raised to the power 0.6. The one chapter with an unusually low lexical diversity is Chapter 16. This chapter contains mostly dialogue between Oz and Dorothy’s simple-minded companions (the Scarecrow, Tin Woodman, and Lion). This returns a data frame with each row giving the count and support for each term. The “count” is the total number of occurrences of the term in the corpus. The “support” is the number of texts containing the term. In the output above, we can see that “the” is the most common term, appearing 2922 times total in all 24 chapters. The pronoun “her” is the 20th most common term, appearing in all but one chapter. The most common words are English function words, commonly known as “stop” words. We can exclude these terms from the tally using the subset argument. The character names “dorothy”, “toto”, and “scarecrow” show up at the top of the list of the most common terms. Beyond searching for single-type terms, we can also search for multi-type terms (“n-grams”). Now that we have identified common terms, we might be interested in seeing where they appear. For this, we use the text_locate function. "When Dorothy was left alone she began to feel hungry. So she went to\nthe cupboard and cut …"
"After a few hours the road began to be rough, and the walking grew so\ndifficult that the Sc…"
"When Dorothy awoke the sun was shining through the trees and Toto had\nlong been out chasing…"
"All this time Dorothy and her companions had been walking through the\nthick woods. The roa…"
"It was some time before the Cowardly Lion awakened, for he had lain\namong the poppies a lon…"
"Even with eyes protected by the green spectacles, Dorothy and her\nfriends were at first daz…"
"The soldier with the green whiskers led them through the streets of the\nEmerald City until …"
"The four travelers walked up to the great gate of Emerald City and rang\nthe bell. After ri…"
2207 ch23      62 Dorothy stood up and found she was in her stocking-feet. 2210 ch24       2 "My darling child!" 2213 ch24       5 "From the Land of Oz," said Dorothy gravely. 2215 ch24       7 And oh, Aunt Em! 2216 ch24       8 I'm so glad to be at home again!" The result of text_split is a data frame, with one row for each segment identifying the parent text (as a factor), the index of the segment in the parent text (an integer), and the segment text. The second argument to text_split specifies, the units, “sentences” or “tokens”. The third argument specifies the maximum segment size, defaulting to one. Each text gets divided into approximately equal-sized segments, with no segment being larger than the specified size. Here is an example of splitting two texts into segments of size at most four tokens. 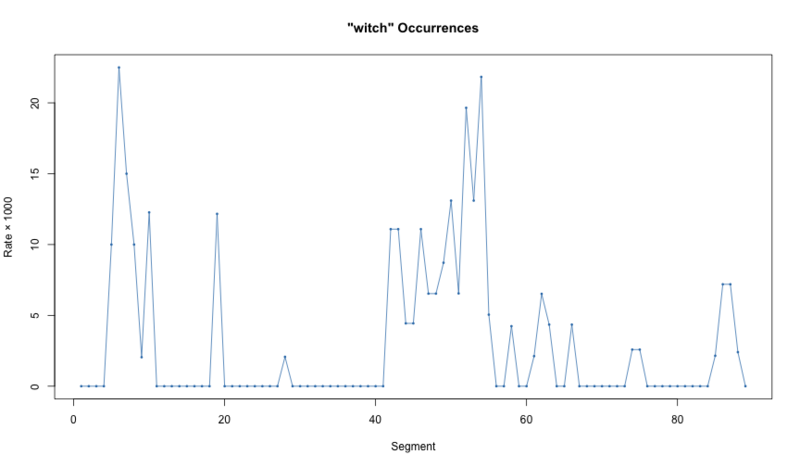 We can combine text_split with text_count to measure the occurrences rates for the term “witch” over the course of the novel. Here, the chunks have varying sizes, so we look at the rates rather than the raw counts. We can see Dorothy’s house landing on the Wicked Witch of the East in the and the subsequent fallout in the beginning of the novel. Around segment 40, we see the events surrounding Dorothy’s battle with the Wicked Witch of the West. At the end of the novel, we see the Good Witch of the South appearing to help Dorothy get home. 24 x 4 sparse Matrix of class "dgCMatrix"
ch01      15   10            .            .
ch02      31    3            8            .
ch07      13    4            .            .
ch08      16    5            1            .
ch09       5    5            .            .
ch13      11    1            2            .
ch14      15    2            2            .
ch16       3    .            .            .
ch17      10    2            .            .
ch18      15    .            .            .
ch19       8    2            .            .
ch20      20    3            .            .
ch21       4    2            .            .
ch22       7    2            .            .
ch23      12    2            1            .
ch24       2    1            .            . The columns of x will be in the same order as specified by the select argument. Note that we can request higher-order n-grams. Corpus provides a lexicon of terms connoting emotional affect, the WordNet Affect Lexicon. Terms can appear in multiple categories, or with multiple parts of speech. The term “chill”, for example, is listed as denoting both positive calmness and negative fear, among other emotional affects. For our final application, we will track emotion word usage over the course of The Wizard of Oz. We will do this by segmenting the novel into small chunks, and then measure the occurrence rates of emotion words in these chunks. We will first need a lexicon of emotion words. We will take as a starting point the WordNet-Affect lexicon, but we will remove “Neutral” emotion words. Rather than blindly applying the lexicon, we first check to see what the most common emotion terms are. A few terms jump out as unusual: “yellow” is probably for the yellow brick road; “down” and “near” probably do not evoke emotions. We can inspect the usages of the most common terms using the text_locate function, which shows these terms in context. Here, we use the text_sample() instead of text_locate() to return the matches in random order. Since we are only looking at a subset of the matches, we use this option to ensure that we don’t make conclusions about these words using a biased sample. Using text_locate(), we would would only see the matches at the beginning of the novel. It looks like “down” is mostly used as a preposition, not an emotion. We will exclude it form the lexicon. “Good” seems to be an appropriate emotion work, evoking positive affection or love. We will keep it in the lexicon. “Woodman” appears within 25 tokens of “heart” in in 45 of the 67 contexts where the latter word appears. The decision of whether to include or exclude “heart” is a difficult judgment call. Most of the time it appears, it describes an object, not an emotion. Still, that object does have an emotional association. I’m deciding to include “heart”, but this is not a clear-cut decision. Over half the time, “yellow” prefaces “brick” or “bricks”, and otherwise it describes objects. It does not describe or evoke emotion, and we should exclude it from the lexicon. Similar analysis not shown here indicates that “great” is mostly used to describe size, not positive enthusiasm; “like” is often used to mean “similar to”, not “affection for”; “blue” is mostly used as a color, not an emotion. All of this analysis shows that we should probably exclude some of the common terms from the lexicon. Now that we have a lexicon, our plan is to segment the text into smaller chunks and then compute the emotion occurrence rates in each chunk, broken down by category (“Positive”, “Negative”, or “Ambiguous”). Here, term_scores is a matrix with entry (i,j) indicating the number of times that term i appeared in the affect lexicon with emotion j. At this point, every term is in one category, but the score for the term could be 2, 3, or more, depending on the number of sub-categories the term appeared in. We replace these larger values with one. To compute emotion occurrence rates, we start by splitting each chapter into equal-sized segments of at most 500 tokens. The specific size of 500 tokens is somewhat arbitrary, but not entirely so. We want the segments to be large enough so that our rate estimates are reliable, but not so large that the emotion usage is heterogeneous within the segment. For the count of each emotion category in each segment, we form a text-by-term matrix of counts, and then multiply this by the term-by-emotion score matrix. For the occurrence rates, we divide the counts by the segment sizes. We then multiply by 1000 so that rates are given as occurrences per 1000 tokens. This is a crude estimate that makes some independence assumptions, but it gives a reasonable approximation of the uncertainty associated with our measured rates. We plot the four rate curves as time series. Our main focus is on the total emotion usage. For this curve, we also put a horizontal dashed line at its mean, and we indicating the “interesting” segments, those that appear more than two standard deviations away from the main, by putting error bars on these points. This is a crude measurement, but it appears to give a reasonable approximation of the emotional dynamics of the novel. There are some interesting dynamics to the “Positive” and “Negative” emotions, but I’m going to focus on the “Total” emotion. There are five segments where the rate of emotion word usage is two or more standard deviations above the mean for the rest of the novel. 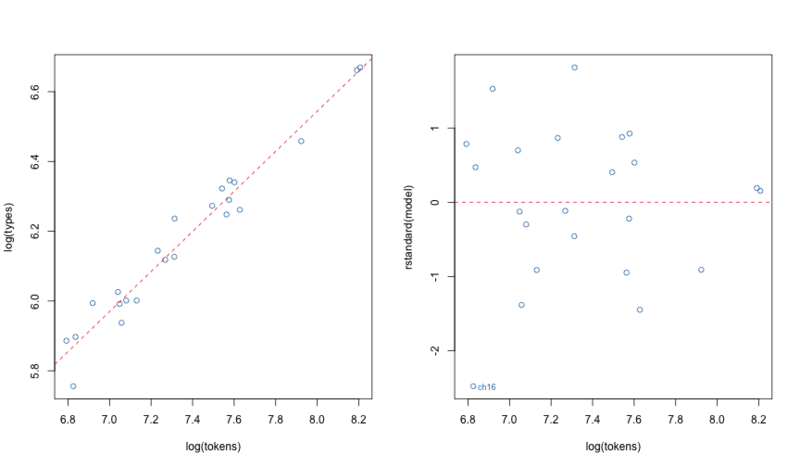 In all five cases, these are statistically significant differences (more than two standard errors above the mean). The first two interesting segments are when Dorothy meets the Tin Woodman and the Cowardly Lion. The next is when the Dorothy and her companions meet the Great Oz for the first time and he tasks them with defeating the Wicked Witch of the West; this is the point in the novel with the highest emotion word usage. The fourth interesting point is when Oz is revealed to be a common man, not a great wizard. The last emotional segment is when Dorothy and her companions leave the Emerald city feeling triumphant and hopeful. The corpus library provides facilities for transforming texts into sequences of tokens and for computing the statistics of these sequences. The text_filter() function allows us to control the transformation from text to tokens. The text_stats() and term_stats() functions compute text- and term-level occurrence statistics. The text_locate() function and allow us to search for terms within texts. The term_matrix() function computes a text-by-term frequency matrix. These functions and their variants provide the building blocks for analyzing text. For more information, check the other vignettes or the package documentation with library(help = "corpus"). Developed by Patrick O. Perry.